Dates are provided as a guide and are not guaranteed; shipment delays due to weather, order processing time, and other factors are possible during the busy holiday season. For fastest processing, please request to ship to your billing address and enter all your credit card information correctly. If your billing address is different from your shipping address, we will email and/or call you to verify your order for your security and prevent fraud. 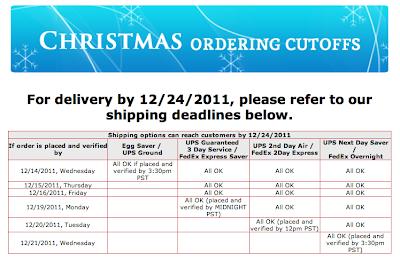 Please respond to your email or phone call so that there is no further delay on your order. Normal processing time is 1-3 business days, but may take longer if your shipping address is different from your billing and we do not receive a verification response. 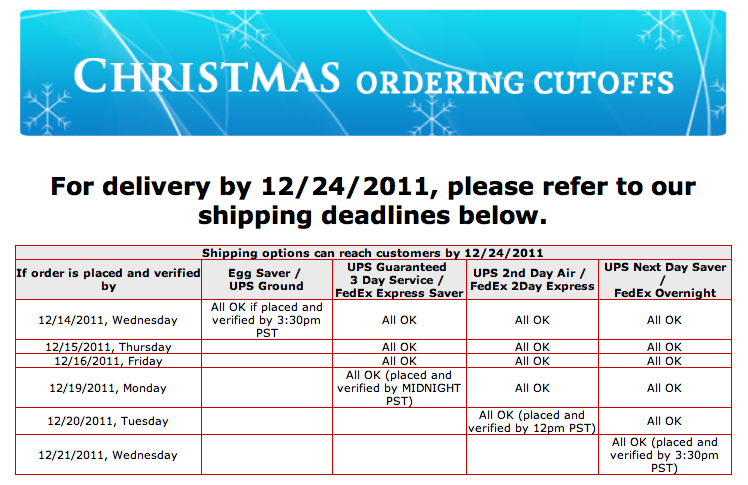 Once your order is shipped out, you will receive tracking information. Once we release your order to the shipping carrier, it is up to them to deliver. We do not allow local pick up at this time. On RARE occasions, there may be extreme weather conditions in your area or there are shipping delays through the carrier. We apologize in advance if that happens. Please call 1-800-ASK-USPS for all USPS packages. Please call 1-800-PiCk-UPS for all UpS packages and have your tracking number ready. We will do our best to process and ship your order as soon as possible. You can always call us during regular business hours (pacific time) If the line is busy or we're out of office, please fill out the contact us page with a detailed message and we will respond as soon as we can.